Cape Cod Lighthouses - The Ultimate Guide to the Cape! Cape Cod lighthouses have been witnesses to history for hundreds of years. They watched over the Cape’s shoreline and sailors in the days when the waters were thick with commercial fishing boats and whaling fleets. Times have changed, of course. There are no more whalers. Commercial fishing certainly still exists on Cape Cod but not at the levels of years past. Cape Cods majestic lighthouses, though, remain. At one point in time, Cape Cod boasted over twenty working lighthouses. Many have been deactivated; some have been knocked down. The ones that remain, however, are beautiful icons of the Cape and reminders of her history. Many of the remaining lighthouses are open to the public for tours. Others are even available for overnight stays! On the Upper Cape, Nobska Point Light and Cleveland Ledge Light are still active lighthouses. Nobska Point is located in Falmouth at Woods Hole and is open for tours (check the schedule at the Coast Guard Auxiliary’s website). Cleveland Ledge Light actually sits in the middle of Buzzards Bay and is only accessible by boat. It is totally automated and is not open to the public. Nearby, Wings Neck Light in Pocasset has been deactivated and is not open for public tour. Its keepers house however is open for weekly vacationing guests! It accommodates eight people. More details can be found at www.wingsnecklighthouse.com . An experience  and a view  that can’t be beat! You also have the chance to stay overnight at a Cape Cod lighthouse in the Mid-Cape region. 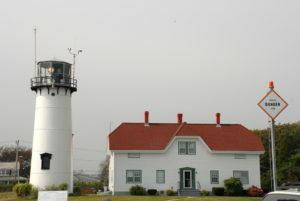 The Bass River Light in West Dennis is the only privately-owned, privately-maintained, Coast Guard-recognized lighthouse in the country. 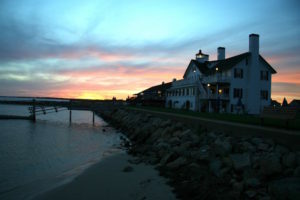 It is located at the Lighthouse Inn (www.lighthouseinn.com ) which has lodged and fed guests on Cape Cod since 1938. The rest of the Mid-Capes lighthouses are closed to the public but their beautiful structures can still be seen by taking a hike on the beach or by boat trip out of the harbor. The Sandy Neck Light in Barnstable can be seen from whale-watching boats leaving Barnstable Harbor. Lewis Bay Light still has a working lantern and sits at the entrance to Hyannis inner harbor. The beautiful stone structure of the Point Gammon Light in West Yarmouth can still be seen from the water. The Hyannis Harbor Light can be seen from Keyes Beach. Where Nantucket Sound meets the Atlantic Ocean, the coastline begins to get a bit more treacherous. As you make the turn north towards Provincetown, the number of active Cape Cod lighthouses increases. In and around Chatham (at the elbow of the Cape), there is one active lighthouse as well as two deactivated stations. Chatham Light is still a working, Coast Guard-operated lighthouse, keeping watch over the Atlantic Ocean. It is absolutely beautiful and is the subject of many photos and paintings found in Cape Cod’s art galleries and gift shops. It is located adjacent to the appropriately-named Lighthouse Beach, a popular, public beach in Chatham. Chatham Light, like all of the Cape Cod lighthouses, has a wonderful history  originally starting with two lit towers (one of which was later moved to Nauset). It is open for tours, hosted by the Coast Guard Auxiliary. You can check the schedule at the Auxiliarys website. Stage Harbor Light is located at Hardings Beach in Chatham. It was decommissioned in the 1930s and is now privately owned. Monomoy Light is located off of Chatham on a spit of land which juts out into the Nantucket Sound. Monomoy Island is now a national wildlife refuge and the lighthouse has been decommissioned. You can take a boat trip to the Island and visit Monomoy Light  check out www.monomoyislandferry.com for more information. On the Lower Cape, there are still five active aids to navigation or operating Coast Guard lighthouses. They are all automated now (some are solar-powered) so there are no lighthouse keepers anymore. At some lighthouses, the keepers house remains; at others, it has been taken down. Nauset Light is located at Nauset Light Beach in Eastham (and not at Nauset Beach in Orleans). Its tower was originally the twin to the Chatham Light down the coast. 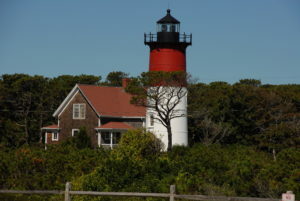 It is now painted a distinctive red and white (which matches its red and white flashes) and is located on Cape Cod National Seashore property. This is the lighthouse on the Cape Cod Potato Chips bags! 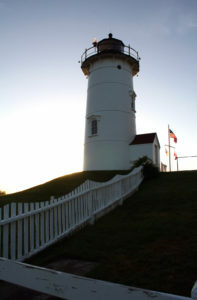 It is still operational and is owned by the Nauset Light Preservation Society. Visit their website for a schedule of free lighthouse tours. Nearby are the Three Sisters, Nausets original lighthouses. They were replaced in the early 20th century by the Nauset Light and have been moved to a park not far from the beach in Eastham  about a 1/3 mile walk from the Nauset Light Beach parking lot. Moving north, the Highland (Cape Cod) Light in Truro is an active Coast Guard lighthouse. There has been a lighthouse station near Truro since 1797. The current tower was built in 1857 but moved inland due to coastal erosion in 1996. The lighthouse is open for tours every day from May through October. The lighthouse website has tour details and a calendar of other events like full moon tours and lectures. It is open for public tours two Saturdays a month during the summer. The keepers house and another building at Race Point Light are also available for a very secluded, weekly vacation rental. More information about tours and overnight accommodations are available at the Race Point website. Wood End Light is another active Coast Guard light in Provincetown. It is not open to the public but you can take a look around the grounds by hiking across the breakwater from Provincetowns West End. Many cruises out of Provincetown will pass by Wood End Light as well. Long Point Light in Provincetown is also still an active Coast Guard lighthouse. Its grounds are open to the public but the lighthouse itself is not. The property is accessible by a rather tough hike over a breakwater and sand or by boat shuttle from the harbor. Try a Flyers tour to Long Point for a quiet day of sunbathing or beach casting for striped bass and bluefish in the shadow of this historic Cape Cod lighthouse. When you get back to town, be sure to check out the Long Point exhibit at the Provincetown Heritage Museum as well an interesting history of a now-extinct community. So, take a morning or afternoon and check out a Cape Cod lighthouse. No matter where you’re staying, there is sure to be one nearby. Soak up a little of the Cape’s history and, in many spots, her unique eco-system. You’ll soon understand why residents and regulars hold these Cape Cod lighthouses so dear and work so hard to preserve them for generations to come. Please leave your questions and comments on Cape Cod Lighthouses below!